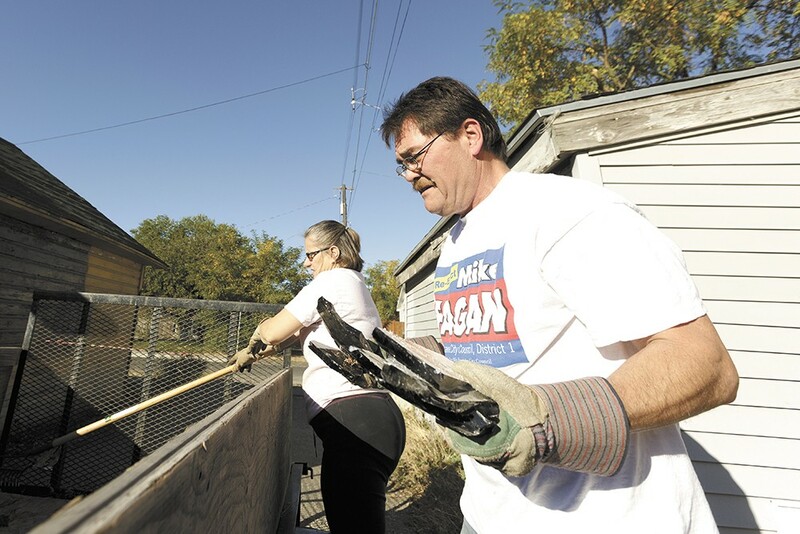 Spokane City Councilman Mike Fagan (right) along with his wife, Donna, load trash during a neighborhood cleanup event. Spokane City Councilman Mike Fagan has a tendency to use the phrase "I'll tell you something," and refer to his audience as "folks." Tonight, those folks are approximately 300 students at North Central High School gathered for the Chase Youth Commission candidates forum, and his voice fills the room as he explains his controversial stances on vaccines, equal pay and other topics. When it's time for Randy Ramos, a first-time candidate challenging Fagan, to respond, he admits he's "especially nervous" about this event and speaks softly into the microphone, expressing near disbelief at his opponent's positions. As the forum wraps up, Fagan says District 1, regarded as the poorest in the city, is about to experience explosive growth, and he hopes he'll be on the council when it happens. "Through my first term on the council, I've gained knowledge, I've gained experience and I've forged wonderful relationships, and I want to be there to help people navigate through it all," says Fagan. But his relationships on the council haven't always been wonderful. As the most conservative member of a left-leaning city council, Fagan has frequently cast "no" votes, sparked controversy and sparred with other councilmembers, all while touting his constituent outreach efforts. His opponents say his approach isn't helping his district, and they're hoping that Ramos, a respected community leader and political newbie who has had campaign missteps, can unseat him. 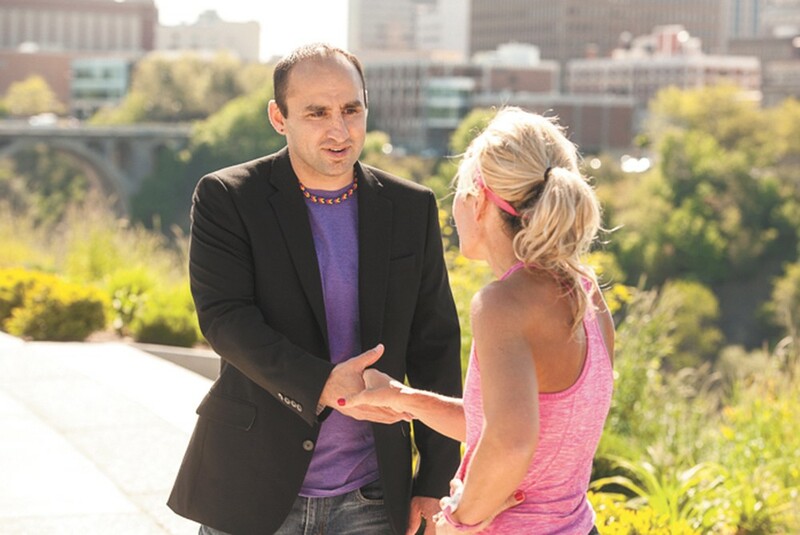 Fagan was elected to Spokane City Council in 2011, a year after he unsuccessfully spearheaded an initiative on behalf of Spokane Patriots, a Tea Party of Spokane splinter group, that would have undone city sustainability programs. Since being elected, he's staked out positions further to the right than the council's business-oriented conservatives, often casting the sole "no" vote. He's opposed bonds and levies for schools, roads and the revitalization of Riverfront Park. He's voted against extending hours at a library in his district and has been the only "no" vote on ordinances ranging from a popular pilot program for mini parks to another targeting wage theft. "I still believe government is by, for and of the people," says Fagan. "And if the people are not supportive, I am going to vote their wishes." During his time on the council, he's continued his work with Tim Eyman, an anti-tax initiative crusader who has come under scrutiny recently after a state investigation concluded he illicitly pocketed campaign money. In 2013, Fagan faced an ethics complaint after he called Gov. Jay Inslee a "lying whore" in a fundraising letter for his initiative group Voters Want More Choices, which was later dismissed. Fagan says he regrets the word choice but defends the sentiment. Councilman Jon Snyder says it was one of the many "bizarre" incidents he's experienced with Fagan. Snyder says Fagan is out of touch with his district, citing his voting record and his remarks on immigrants. "District 1 has a lot of immigrants. Rogers [High School] has a lot," says Snyder. "And when someone starts railing against crime and disease and connecting it to immigrants, it's a slap in their face." In February, Fagan made national news and was nearly removed from the health board after questioning the safety of vaccines and linking measles outbreaks to immigrants. Ramos, meanwhile, takes issue with Fagan's opposition to efforts to address gender- and race-based pay disparities among city workers. He also faults Fagan for supporting an initiative petition that would reverse an ordinance preventing city employees from inquiring into people's immigration status. "His words and his record speak for itself," says Ramos. "I'll leave it at that." Since graduating from Spokane Tribal College in 2012, Ramos worked as a life skills coach at a drug treatment center and as a recruiter for the college. As a recruiter, Ramos spent time at homeless shelters and community courts, looking for unconventional students to attend the college. The experience, he says, gave him a close look at Spokane's social problems. When his contract with the college ended in July, Ramos intended to continue his education. But a friend suggested he'd have a greater platform on city council to address the lack of jobs, inadequate mental health services and need for affordable housing. "I was seeing that there's a lot more in this community that needs to be addressed before you can get to higher education, which is something I feel strongly about," he says. Shelly Wynecoop, director of the college, describes Ramos, a 2014 Peirone Prize winner for community service, as passionate about helping the underprivileged, and it seems natural to her that he would run. But Ramos has had some stumbles. The 36-year-old had never registered to vote until February of this year. He nearly lost the primary to Ben Krauss, who effectively quit campaigning, and it was revealed that Ramos has a DUI conviction from 2009. Neither Council President Ben Stuckart nor Mayor David Condon has been as involved in this race as they are in others. Stuckart says he'd vote for Ramos if he was in his district, but hasn't formally endorsed him. Fagan says Condon has endorsed him, but not as publicly as he has other candidates. Randy Ramos, a first-time candidate, out on the campaign trail. Although Ramos has broad support from organized labor, the union representing municipal workers declined to endorse anyone in the race. "We're not sure what's going on with Randy's campaign," says Jim Tieken, the union's political action coordinator. "We just haven't seen much of Randy, unfortunately." Noting that Spokane has a large population of urban Indians, Snyder says Ramos, a descendant of the Colville Tribe, would bring a valuable perspective, among other qualities. However, Snyder has concerns, saying Ramos should have disclosed his DUI early on. Running in a poor district, Ramos has had his own struggles with money. According to his financial disclosure forms filed in July, Ramos, a single father of four, had $600 in his bank account and made $12 an hour from his recruiter job. Currently, Ramos renovates houses when not campaigning. "It is tough at times, extremely tough," he says. "But that's why I'm running. I want to make sure that people with similar experiences have a better quality life." On the council, Fagan has tried unsuccessfully to regulate bikini baristas, and his biggest legislative accomplishment is placing a proposition changing how the mayor's salary is determined on the August ballot, a measure that was approved by voters. He's content with his few legislative victories. "You don't always affect change in the city by changing policy and law because what you can do as an alternative is be an advocate," says Fagan, 55, who describes himself as a "servant leader." Some in his district say they disagree with Fagan, but when it comes to constituent services, he sets his politics aside. They say he attends neighborhood council and business association meetings, explains what's going on at City Hall, returns phone calls and helps citizens navigate municipal government. Luke Tolley lost to Fagan in the 2011 race. But now as chair of the Hillyard neighborhood council, he calls Fagan a "model councilman" for how well he communicates with constituents. Fagan also has been praised by the local taxi association, and the Guardians Foundation, a veteran's support nonprofit, plans to name a new housing facility after Fagan for helping them obtain a fundraising permit in Spokane that bolstered their finances.